The staff and shuttle service was very good and friendly. I have stayed at this hotel several times. The front desk staff is consistently wonderful. However the hotel is starting to show wear/tear. The floor length mirror in my room was cracked completely across the width and held together by tape! Stayed here on business due to the location near the airport. It was a bit too close as the planes taking off were incredibly loud. I was given a room that was adjoined to another via a locked door. I could here everything my neighbor was watching, saying, and doing. Not a restful night. I also discovered that the room was not cleaned properly, there were oily hand prints on the bed headboard and dirt in the bathroom along with an uncleaned toilet. I will not stay here again or at any Alofts after my experience. That being said, the staff was quick to change my room and very welcoming. Given that we were at the hotel to be safe during what we thought to be hurricane Florence, I had low expectations in regard to staff attendance and amenities. However the first room they assigned wasn’t clean from its previous occupants. The second room assigned was on the fifth floor. The first impression was that it had a different aesthetic. The room held two queen beds and accommodates myself, my husband, our two teens, and our dog. (Yes, they are pet friendly at no additional charge) Once settled we noticed some things that were in need of repair. The ceilings looked unfinished and there was an area of the ceiling that was brown and deteriorated. The sliding mirrors door to the toilet and shower did not lock. The phone was difficult to operate and didn’t work properly. Maintenance had to come and take the phone and forgot to replace it. The beds were nice and tidy until we pulled back the covers to find some staining on the sheets. One of the comforters looked to have blood stains. The television though quite large was difficult to operate as the channels are irregular. They are double digits with a dash and an additional digit. There was a box on the desk that allowed for special plugins to the tv but they didn’t work. He mattresses were atop a platform that didn’t have borders so the mattress slid in all directions anytime there was movement. I understand that this hotel means to stand out but it was frustrating because it lacked comfort. The staff stole my watch from the room. Made a police report and had to wait 3 hours for the manager to get to the hotel and while we were waiting another person reported her wallet missing from her room. The hotel staff was very friendly; they helped us out with checking in and when there was an issue with the online booking. Great, easy checking in and out. Neat and well proportioned room. Bed linens were not changed. There were rose petals under the comforter and hair on pillow cases. Trash was in the trash cans (rose stems and potato chip bags. Air conditioner did not work. Checked in to a super nice Mgr Room AC was broken T check in Moved to a handicap room where if you were taller than 5 feet the shower was a hassle to use. Not a great first time visit to an Aloft Hotel. Was hoping for better. I enjoyed the stay. The bed was so comfortable. And I enjoyed my room. I stay there occasionally. I wish it was more affordable. Charleston Tanger Outlets is within a 5-minute walk of Aloft Charleston Airport & Convention Center while other popular sites like North Charleston Coliseum and Performing Arts Center are within a mile (2 km). This 3-star hotel has 136 guestrooms and offers an indoor pool, a 24-hour fitness center, and free in-room WiFi. Start your day off with cooked-to-order breakfast, available for a fee. Entertain your taste buds with a beverage at the bar/lounge or coffee shop/café. A 42-inch LCD TV comes with pay movies, and guests can stay connected with free WiFi and wired Internet. Beds sport premium bedding and the bathroom offers a hair dryer and designer toiletries. Other standard amenities include a refrigerator, a coffee maker, and free local calls. Guests staying at Aloft Charleston Airport & Convention Center enjoy an indoor pool, a 24-hour fitness center, and free WiFi in public areas. There's free parking, as well as a free airport shuttle (available 24 hours). The 24-hour front desk has multilingual staff ready to help secure valuables, and answer any questions about the area. Additional amenities include a meeting room, a business center, and an arcade/game room. W XYZ Bar - Lobby lounge. 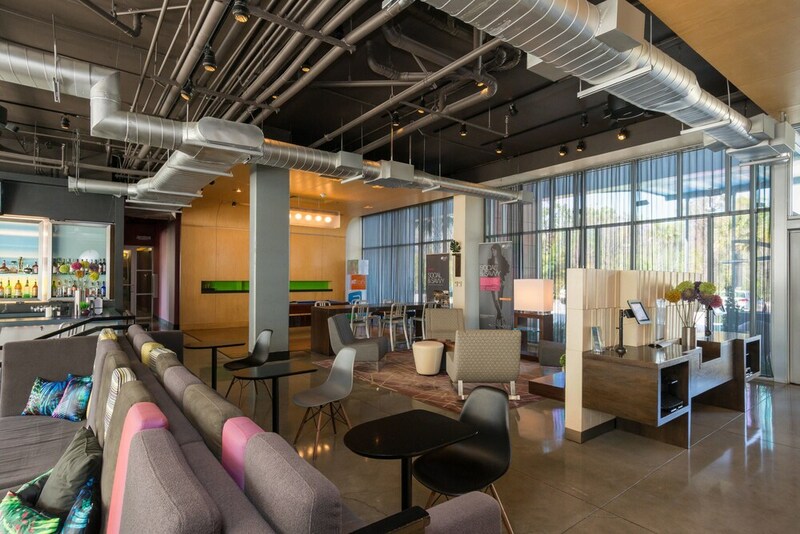 Recreation features at Aloft Charleston Airport & Convention Center include an indoor pool and a 24-hour fitness center. The preferred airport is Charleston, SC (CHS-Charleston Intl. ): 8-min drive, 2.8 mi/4.4 km. The front desk is open 24 hours a day, and checking in and out are easy with express services. For convenient arrivals and departures, you can take advantage of the free airport shuttle (available 24 hours). Driving? This property offers free self parking, along with free extended parking.